Question for the Jesus Mythicist? ROOK HEAD TO YOUTUBE!!!! It was already done. This dumbass won't respond. It was already done? Where? I'd also like to see an academically respectible case made for these supposed parallels rather than the usual amateurish cut-and-paste crap that repeats assertions without reference to detailed sources. I must say something that didn't repeat tiresome fantasies about "Mithras and his twelve disciples" would make a pleasant change to the usual Freke and Gandy/'Acharya S" New Age amateur/comedy hour. Where can this scholarly analysis with sources be found? The "Wise Old Atheist" says: They decided to invent a god and came up with one who looked like a peasant preacher from Galilee?! Were they on crack? Hmmm, for a group that calls itself the "Rational Response Squad" it sure is hard to get a response to a simple request. Thinking perhaps the elusive Rook Hawkins had already posted something detailing some actual evidence (not assertions) about these "parallels" between Jesus and earlier gods on YouTube, I went searching for them. I did find some other videos by Rook, including one where Sapient introduces Rook as "highly specialised and honed in ... ancient history and Biblical knowledge". This, remember, is the same "highly specialised" Rook Hawkins who claims the canon of the Bible was fixed at the Council of Nicea and that the Arians didn't believe Jesus was divine: two blunders so elementary that they'd make the most muddle-headed first year undergraduate blush in shame. So much for Rook's high degree of specialisation in ancient history. Anyway, this 24-year old self-declared specialist didn't have any videos where he detailed these supposed parallels between Jesus and earlier gods. But I did find this hilarious gem and this work of comic genius. It looks like the guys who made those two pastiches of laughable crap were more keen and presenting stuff they hadn't checked but desperately wanted to believe than they were on getting their facts straight. 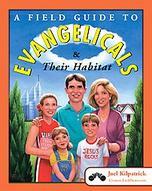 Again - fundamentalists do that sort of crap. We atheists are meant to be the smart ones. Why are we letting this kind of dumb nonsense presented in our name go unchallenged? This garbage pseudo history just makes atheists look stupid. A rational response from the "Rational Response Squad" on why similar sloppy errors are being propogated and endorsed here would be good. was around in stickam a while back. Rook and he had a few discussions already. As far as qualifications go, you arrogant prick. Rook is good friends with Richard Carrier, Robert Price, and a few other names worth mentioning. That's academic. Show #23, I think, was Carrier and Rook discussing the mythicist position at length. Price used to allow for the presupposition that jesus existed until Rook and he exchanged a few messages. Last I checked, Price is now a mythicist too. You've had 16 days of membership. That's an adequate amount of time to see that Rook spends more time on jesus than Mithras or any of the other saviour gods ignored or transformed by the christians. Including astrological deities based upon middle eastern astrologers. Have you listened to any of the shows discussing this topic? If you have any new knowledge with regard to mithras, Zoroastrian deities, or others then I would love to read it. For someone asserting they are an educated atheist, you certainly come off as one of the myspace teen christians from whom we regularly get e-mails. I'm sure that, as an alleged atheist, you can appreciate that your evidence FOR the existence of jesus as a historical figure should be presented first. I was hoping that someone so reputedly(by themselves) intelligent or wise would understand that whole 'burden of proof' thing. If you have to say you're smart then you might be the only one saying it. As far as qualifications go, you arrogant prick. Rook is good friends with Richard Carrier, Robert Price, and a few other names worth mentioning. Wow! I know Bart Ehrman. I must be a genius in biblical and historical studies. In fact, Rook does not have a degree in history. He is an intelligent man, but a degree goes a long way in terms of credibility. I have not done a lot of research on Carrier, but in what I've found he makes some odd mistakes. Now, if Robert Price is a mythicist, I find that hilarious. He is in the Jesus Seminar. The Seminar tries to determine authrntic sayings of Jesus within gospel texts. I can only imagine what a debate in the Seminar would sound like with Price. Crossan: "I find that this verse has eschatological undertones which reflects viewpoints of an early Christian community." Funk: "This is true, however the verse also attempts to break religious boundaries, thus it could stem from an idea of Jesus." Crossan: "I agree with your point Dr. Funk, I think we should allow a grey designation." Funk: "I second that Dominic." Price: "Uh...yeah I still think that Jesus didn't exist." Crossan: "Thank you Robert Price, your useless additions to the discussion are oh so helpful." Now, if Robert Price is a mythicist, I find that hilarious. He is in the Jesus Seminar. The Seminar tries to determine authrntic sayings of Jesus within gospel texts. I read on another thread that you're interested in the Jesus Seminar. You might be interested in The Jesus Project run by R. Joseph Hoffmann. He talks about it in this podcast. He doesn't talk that positive of the Jesus Seminar. Ahura Mazda,As far as qualifications go, you arrogant prick. I don’t think I mentioned my qualifications anywhere in any of my posts. Though I do mention in my sig that I’m an amateur who doesn’t pretend to be anything else. I certainly don’t pretend to be an “historian”, except in the loosest sense of the word – ie someone who studies history. What your abusive reaction above may be responding to is where I pointed out that Jesus Mythers tend to be amateurs while professional historians – ie the ones who work in research and teaching positions in accredited universities and publish in peer reviewed publications – almost universally reject the Jesus Myth hypothesis as weak, ideologically-driven special pleading. Rook is good friends with Richard Carrier, Robert Price, and a few other names worth mentioning. That's academic. Being “good friends” with academics makes you some kind of expert?! On what planet does this happen? In that case, I’m an “expert” in geology, social work and corporate law. Richard Carrier is an amateur who has pretty much the same level of qualifications as I do. The only publications he’s had in a peer reviewed academic publication are his articles on “Epicurus” etc in Encyclopedia of the Ancient World. He’s an amateur with solid qualifications and he’s certain worth reading in ways that hacks like Freke and Gandy or kooks like “Acharya S” are definitely not, but a professional scholar he ain’t. Robert Price, on the other hand, is a professional scholar. A theologian rather than an historian, but at least a professional one. He’s also pretty much the lone ranger amongst scholars who takes the Jesus Myth seriously. You can also find professional scholars in science and medicine who don’t think smoking is bad for you. If you look hard enough, that is. That’s nice, but this thread is about Mithras and the original poster’s distress call was to young Rook, hoping he’ll be able to answer our Christian pal about Jesus and pagan god parallels. I then asked if there were any proper analyses of this topic here, since “MattShizzle” asserted there was. And I don’t mean a rehash of the usual crap that makes weird assertions about Mithras “dying and rising from the dead” or being “given gifts by three kings” or other fantasy claims based on zero evidence cut and pasted from crap websites. If you’d read my posts above before you started scolding me, you’d see I was asking to be directed to such discussions. I’ll ask again – where are they available? Sorry, I just have old information about those topics – the stuff based on evidence. What I don’t have is any evidence to support the crap that is regularly asserted on this subject, such as the ones in those hilarious YouTube videos. That’s because the evidence for most of those claims doesn’t exist. My earlier question still stands – why are people here supporting similar baseless claims? We don’t let fundies get away with garbage like that, so why stand by when atheists indulge in similar pseudo historical nonsense? Or even perpetuate this unscholarly crap? Aren’t we meant to be the smart, well-read ones? Because I’m not sticking to the group-think party line of mindlessly accepting anything and everything that sticks it to Christianity? Sorry, but I don’t like intellectual dishonesty or sloppy scholarship regardless of whether it comes in a theistic or an atheistic wrapper. Fundamentalism makes people indulge in dumb thinking and accept crap arguments. That’s as true for atheistic fundamentalism as it is for the more prevalent theistic variety. When people make statements like “Mithraism was the state religion of the Roman Empire” or “the Arians denied the divinity of Jesus” then they are flatly and completely WRONG, and the fact that they may be atheists doesn’t change the fact they are wrong for a second. Nor is that going stop me from slapping them in the head for being so sloppy and stupid, since they make all of us look dumb by their feeble errors. Thanks – I had a bet with myself about how long it would take before someone tried to insinuate that I’m not an atheist. Please don’t be so boring. … you can appreciate that your evidence FOR the existence of jesus as a historical figure should be presented first. I was hoping that someone so reputedly(by themselves) intelligent or wise would understand that whole 'burden of proof' thing. (i) All of our sources, Christian or otherwise, say that he was an historical figure and none say, hint or in any way indicate that he wasn’t. This is despite the fact that this would be a powerful argument in the hands of early Christianity’s Jewish and pagan opponents. The idea that not only did the whole of Christianity somehow forget that Jesus had never existed, but that this bizarre, comprehensive mass amnesia afflicted everyone else as well stretches credulity past breaking point. (ii) The Jesus Myth hypothesis can’t just be a possible or even a plausible alternative explanation – it has to explain the evidence better. Leaving aside the fact that most Jesus Mythers’ explanations as to who invented Jesus, when they did so and why are either (a) farcical or (b) totally absent, the stories we have about Jesus contain elements which were awkward for early Christianity and represent anomalies in the narratives. If an historical Yeshua existed these anomalies are easily explained – they’re in the stories because they are historical, even if they were awkward. If Jesus didn’t exist, however, the Jesus Myth hypothesis needs to explain how these odd elements found their way into the story. Why, for example, invent a Jesus from Nazareth, of all places, and then tie yourselves in knots trying to explain how this Galilean was actually born in Bethlehem. Why not invent a Jesus from Bethlehem in the first place? Why the hell is Nazareth in there? Unless, of course, he did exist and he came from Nazareth. When the Jesus Mythers either forget to even posit an explanation as to who invented Jesus, when, where and why or present explanations that involve vast leaps of credulity (like Doherty’s requirement that we believe in a whole branch of Christianity that exists nowhere outside of his contrived thesis), it’s hardly surprising they don’t convince anyone of any significance. In my experience, when you have some amateurs with an ideological axe to grind on one side and a large number of professional scholars from a variety of standpoints on the other (in this case Christian, Jewish, agnostic and atheist), the smart money is on the professionals. This is the case with Creationists. It’s the case with Holocaust Deniers and it’s the case with the Jesus Myth. You know what they say...If you have to say you're smart then you might be the only one saying it. Now who sounds like a pouty Christian teen whose fundie parade has been rained on? It's a little difficult to take you seriously when every post attacks Rook. The info that Rook has posted has checked out from other sources for me on a consistent basis. I respect that. Rook is writing a book containing more info than he has ever posted here in the forums. He has been advised by many people NOT to let the subject matter leak too much. Doing Squad work, book work, helping laypeople get a better education, and living is going to take him away from the forums and his blog. If you're not willing to admit that your incessant attacks on someone's credibility based upon your own opinions is unwarranted then where are we? It seems it’s very important to them that there be no “Jesus” in any sense, for some reason. People who are arguing simply that there was a Yeshua, but that the figure of “Jesus Christ” is a mythic one that grew out of stories about Yeshua are people I have zero argument with. Largely because that’s precisely what I believe. Which Yeshua? That was a pretty common name. 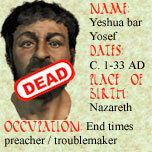 How many Yeshua's were also 'christos'? The shows are available on the left hand side of this page. The Carrier shows are lumped together. jesus was even on a show. lol. Rook's book will be available when he gets it done. I know too much about what is in it and thus you're not going to get much from me. I'm no teen either. I also don't outright call myself 'wise', but I respect people who say that about me after I prove it to them. It's a little hard to take your high-minded scolding about "attacks" and "ad hominems" seriously when your opening words to me were "you arrogant prick". How charming. It's also a bit hard to know what to make of someone so hyper-sensitive and defensive that they mistake valid criticism for simple mean-spirited "attacks". I've made it very clear why I'm criticising Rook - the demonstrable historical errors in his material. And if I've used some sarcasm for rhetorical emphasis, then its been far milder than most of the sarcasm I (and most other atheists) use when pointing out similar clumsy errors made by Christian fundies. We, quite rightly, don't let smug Christians get away with basic blunders, so why should Rook be given a free pass? Because he's one of us? That makes things worse - we're meant to be the smart ones who do our homework properly and who don't latch onto false ideas simply because they suit our point of view. Terrific. Then since you're keen on checking out information from other sources, maybe you'd like to stop pretending that I'm simply some big meanie who's coming onto this board to shout "Rook is a poopyhead!" and go check the specific claims that I've criticised. See if you can find a source that supports the idea that the Council of Nicea set the canon of the Christian Bible in 325 AD. Or find me a source that supports the claim that the Arians denied Jesus' divinity. If you can find sources that support these claims, then congratulations - you'll be the talk of the historical academic world and have a golden future as the renowed historian who discovered something everyone else has overlooked for the last 250 years or so. If (or, rather, when) you can't find any such sources, you might want to rethink the validity of my criticisms of Rook. Are you seriously telling me this 24 year old who doesn't even have an undergraduate degree has discovered material that proves that the Arians, in fact, did deny the divinity of Jesus or that the Council of Nicea did, in fact, discuss the Canon? Because that's what would be required for Rook to be right on these two points and for every other historian on the planet to be wrong. If that's the case, then that is going to be one cracker of a book. Somehow I suspect, however, that this is not the case at all, and Rook just made a couple of rather basic mistakes. Where you seem to be is still labouring under the misapprehension that criticisms are "attacks" and that my criticisms are just my "opinions" rather than based on fact. The Arians did believe Jesus was divine. That's just an historical fact - not my "opinion". The Canon was not even discussed at Nicea, let alone decided there. That's just an historical fact - not my "opinion". If pointing these facts out hurts your feelings, then I'm afraid that's bad luck. We would jump all over any Christian fundie who made errors like that, so why let an atheist get away with it? Especially considering it seems people here are trusting this guy as a reliable source of information and analysis. One from Galilee, apparently. From Nazareth, to be exact. That's what the later stories indicate, and this seems to be one part of those stories which is reliably historical. And we can say that because the idea of a Messiah from Nazareth was a problem for the early Christians, since the Messiah was meant to be Bethlehem and his later followers had to work very hard to explain his Galilean origins away. This indicates that they were something they simply couldn't deny. And it also indicates that he was not a Messiah that someone just made up, since the Nazareth element is incongruous. None that we know of. Claiming to be the Messiah or having this claimed about you was a pretty big claim. As far as we know, Jesus was the only definite such claimant in the First Century and we have to wait until Simon bar Kokhba in the Second Century before we get another person who we can definitely say was such a claimant. Even with Jesus it's highly unclear whether he made this claim about himself, whether others made it about it in his lifetime or it the claim wasn't made until after his execution. Thank you. And the Carrier shows are the ones that deal with Mithras and the pagan parallels? That's what this thread is actually about, after all. Reading his posts I suspect it's simply going to be a popularisation of Doherty's thesis. Unless, of course, he has discovered new material that shows the Canon was set at Nicea and that the Arians denied that Jesus was divine. If so, then it'll be the most astonishing work of groundbreaking, seminal research of the last century or so. But somehow I don't think so. As an Australian, I have a wry sense of humour about most things, including myself and my advancing years. But I realise that many people here are both young and American and so tend miss dry irony. I've now put "Wise Old Atheist" in inverted commas/quote marks. I hope that makes the tone a little clearer. I showed you where the shows were. It isn't my problem if you're already made up in your mind. It's always much easier to just ignore something that might change your mind in favor of dogma. In my opinion, dogma has no place in history study. Soooo. simply accepting the words of these allegedly great historians that can assert that jesus was a real man with only evidence provided by the people who make bank on his existence seems like a rather foolish error for a wise man to make. I read ALL of your posts in the other threads. If you're clinging to these two things to dispute with Rook. Arius' works are gone. Correct? Allegedly burned by the council due to dissent of the creed. In fact, the Visigoths and Vandals even after Trent still disputed this little tidbit along with varying assertions concerning the 'promulgation' issue. As far as the 'canon' issue at Nicea. Textual evidence was needed for both sides. I agree that there was no agreement on the canon until Trent. However, the unification of evidence (Symbolum) was. The nicean creed??? Remember? That pretty much implies which books would be accepted at a later date in addition to the 20 canons dealing with behavior of the church fathers. Essentially, any who opposed any piece of this were ostracized and discredited on principle. Even the precursors of the two councils. Nicea opened the door for Trent and it took that long for the 'correct' books to be gathered. right? So why is it that this seems only to support the mythicist position to me? Rook goes further back trying to figure out how these people arrived at this conclusion that a real man needed to exist. He doesn't go into it with a preset notion. However, this 24 yr. old 'kid' has found correlation that supports jesus mythicism. That's all you're getting from me. As far as your rationalizations go concerning argumentum ad populum, ad authoritatem, and ad hominem have jaded me. I'm afraid my wry sense of humor concerning Aussies has been tainted by you. Good thing they've given us Kylie and Danni Minogue, Rachel Hunter, and Elle Macpherson. Otherwise, I'd be hard-pressed to find a use for the place other than a prison colony. LMAO. 1.- The "eucharist" of Osiris god of grain. His followers would eat his body, i.e. bread, and blood, i.e. beer. Doing this would give his followers eternal life after death. Originally they believed Osiris was responsible for the revival of vegetation in the spring. This later mutated into the belief that he could also give life after death. It always seemed so strange to me when Jesus said all that about his body and his blood being bread and wine. But it does make sense in the more ancient cult of Osiris. He's the god of grain. Believing his body is made of bread and his blood is beer (made of grain too) is perfectly understandable. Also, we know the egyptians believed that you could aquire the powers of gods by eating them. They had legends of gods killing other gods and thus aquiring their powers. 2.- The Hilaria of Attis. Where his followers after having buried the god in a cave and having wept for his death would rejoice on the third day for his resurection. This is attested explicitly in the 3rd century only I think. But we know that they celebrated a 'Holy week' during the time of Claudius where he added one more day of celebration. I've heard apologists say that since it is only mentioned later explicitly that it was copied from Christianity. This is hard for me to believe because we know their celebrations included mourning for the god before Christianity (like for Tammuz whose followers are even mentioned in the bible as weeping for him) and we know that these cults had their origins on the revival of vegetation during spring time so why would the not celebrate the revival too which was the whole point of the cults. Robert Price mentions pottery depicting Attis in his resurected pose (dancing) which has been dated to the 1st century BC I believe. Also, the early church fathers do not accuse the pagans for copying this from them when they mention the celebration in the 3rd century. I agree all the other paralles I have heard do not hold much water after close examination but the 2 above seem more solid to me. I am a complete amateur at this so i may well be wrong about the above parallels too. If you have better information please let me know. I've made up my mind I've got better things to do with $15, and that's about all thanks. It's always much easier to just ignore something that might change your mind in favor of dogma. That's a heck of a conclusion to draw from the fact that I'd rather not spend $15 listen to a guy with an MA talk to two 20 somethings. I've read some of Carrier's material on the Secular Web, including his critique of Kersey Graves - the idiotic Nineteenth Century origin of most of this Jesus/Pagan parallels crap. Where his material touches on parallels at all, they tend to be ones based on real sources - not this garbage about Mithras having "Twelve disciples" etc which is pure fantasy. But even when his language about possible parallels is cautious, he draws some dubious bows. Saying that Osiris was dismembered and though Jesus wasn't, his clothes were, for example, is bordering on plain silly. In my opinion, dogma has no place in history study. That's one on the reasons I have a problem with the Jesus Myth hypothesis - almost without exception its proponents are atheists with an almost evangelical zeal, usually with a formerly fundamentalist background. Whereas on the other side we have scholars who are Jews, Christians of various varieties and degress of credibility, agnostics and atheists. Which side has the ideological axe to grind here? And I'm curious as to what "dogma" you think I subscribe to. What are you talking about? Soooo. simply accepting the words of these allegedly great historians that can assert that jesus was a real man with only evidence provided by the people who make bank on his existence seems like a rather foolish error for a wise man to make. Sorry, but these "allegedly great historians" consist of ... ummm ... all the professional historians who have examined the issue. And to pretend that they simply take the Christian evidence at face value is either ignorant or naive. Whether you're really that ignorant of how history is studied or you're just trying to be childishly irritating is both unclear to me and of little interest. Actually, this thread was about claims about Mithras and other pagan gods. I'm still waiting for an answer with more substance and maturity than "Pay $15 and listen to this semi-qualified guy talk to these two unqualified guys in a self-congratulatory smug fest"
The Council burned some copies. Others hung around for centuries, since Arianism did rather well for a while largely thanks to its adoption by the East Germanic peoples. There was a point in the Sixth Century when Arianism seriously challenged Catholicism in the west and where Arian works flourished. The collapse of the Ostrogoth kingdom and the conversion of the Visigoths and Gepids put paid to all that and people stopped copying Arius stuff. Then it was lost. But regardless of that, orthodox writers loved to detail what their opponents believed so they could then crow about how wrong they were. So we have plenty of information about what Arianism entailed, including multiple sources from the time of the original controversy and from the later disputes due to the rise of Arianism in the Germanic successor kingdoms. Have you read any of that material? Can you cite me a single piece of it that indicates the Arians "denied the divinity of Christ"? You will astound and amaze the whole academic world if you can. Or are you trying to claim Rook's secret book contains this marvel? *Sigh* Considering the Council of Trent was in 1563 it would have been remarkable if any Visigoths or Vandals were disputing anything at all after it, considering those peoples had been extinct for about a millennia by the Sixteenth Century. I'll assume you typed "Trent" for "Nicea". And what were those Arian Vandals and Visigoths (and Ostrogoths, Skirians, Turcilingians and Gepids) disputing exactly? Were they disputing whether Jesus was divine or not? The answer is "No" and anyone who says they were either (a) doesn't have the faintest, most elementary grasp of how Arianism differed from the Orthodox position or (b) is deliberately trying to deceive other people who don't. Either way, they can't be taken seriously. As far as the 'canon' issue at Nicea. Textual evidence was needed for both sides. I agree that there was no agreement on the canon until Trent. No ecumenical agreement. Earlier synods had proclaimed the Canon of Athanasius as early as the Synod of Hippo in 393, though Damasus I seems to have declared an identical canon in 382. Both are identical to the canon laid out in Athanasius' Festal Letter of 367, which in turn has only a few more works than the Muratorian Canon of the late Second Century. Most of the differences in the debates over the canon in the Second to Fourth Centuries were over non-gospel works: the four canonical gospels were accepted almost universally (Marcionites excepted) by non-Gnostics from circa 160 onwards. In other words, the Canon evolved from the mid-Second Century until around 400, where it became more or less fixed largely by convention. The Council of Trent only hardened that convention into edict in the face of the challenge of Lutheranism. However, the unification of evidence (Symbolum) was. The nicean creed??? Remember? That pretty much implies which books would be accepted at a later date in addition to the 20 canons dealing with behavior of the church fathers. Yes. And? Big deal - by 325 the discussion on the Canon was all but over. And news flash: the Arians accepted the same books as the rest of the proto-orthodox church. There were no special Arian scriptures which were burnt, just works of Arian theological interpretation of those shared scriptures. Essentially, any who opposed any piece of this were ostracized and discredited on principle. Even the precursors of the two councils. Nicea opened the door for Trent and it took that long for the 'correct' books to be gathered. right? Nicea was a step in the long process of the formation of the Canon largely in that it gave impetus to the trend for centralised codification. But the canon was not discussed there and the texts that were examined and censured were not scriptures, but works of Arian theology. Beats the hell out of me. Nicea didn't discuss the canon and no Biblical texts were amongst the censured Arian works. Where you got the muddled idea that they were is anyone's guess. Have you tried reading academic works and primary texts instead of third-hand misinterpretations by amateurs? Give that a go. The academic world waits to be amazed. Or not, as the case may be. If he doesn't have a degree in history, BTW, what is he trained in? Does he have any training? Note that's it's the training in method that I'm interested in, not the pieces of paper on his wall (though the two tend to be connected). Gosh, good thing you're above ad hominems! And your taste in women seems to run to the plastic and 80s to a disturbing degree. Especially considering Australia can boast beauties such as Rose Byrne, Megan Gale, Cheyenne Tozzi and Jennifer Hawkins. You clearly need to educate yourself. About a great many things. C'mon That one was funny. Plus since you and i are old-timers I thought the references were better for Aussie models. You make atheists look like complete assholes. A slightly larger concern. Better drop that chip on your shoulder, last warning.
. Again - fundamentalists do that sort of crap. We atheists are meant to be the smart ones. Why are we letting this kind of dumb nonsense presented in our name go unchallenged? This garbage pseudo history just makes atheists look stupid. Reading much of what you and others write it seems odd to me that you ban people due to their attitudes, yet you have no problem presenting yourselves in the same manner.